I agree, Erum, this set will be a fast sell-out, especially when people see the stunning showcase you've created! The colours, the design...a knock-out! I can tell you had fun designing this card; it's infused with joy! Gorgeous gorgeous card! I love it! Such a beautiful card with awesome coloring! Love the 3D effect coloring!! Amazing card! It’s beautiful! I love how you layered it and added in the shadows! It gives it real depth! I agree this set will sell fast! I have it on my wish list! What a beautifully created card! I love the way you extended the Studio Katia stamp across the panel! Your coloring is lovely! Thank you for sharing! Wow! What a beautiful card. Love the color and the texture. Your card is gorgeous. Thanks for sharing. your beautiful coloring. This is my fave set of the release. Love your beautiful coloring! great idea to cut and color a second set of flowers and put behind the tea cup. Thank you for sharing. This is gorgeous! love the coloring and how you used the stamp. Gorgeous card! 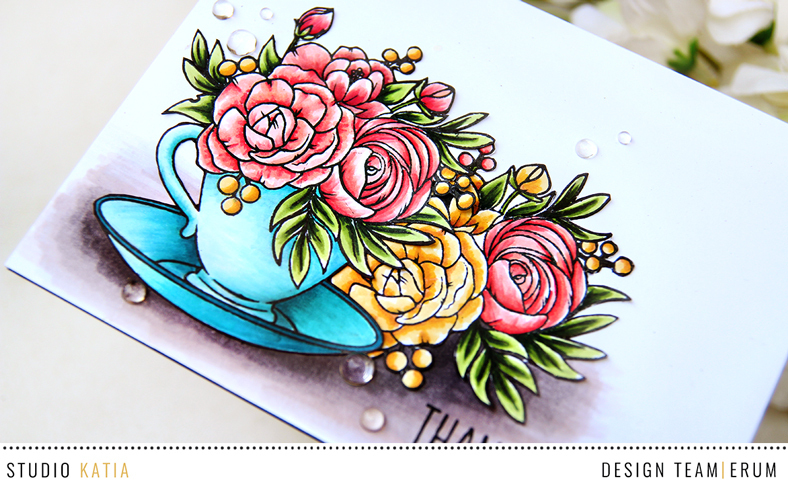 I love that tea cup bouquet stamp set! Thanks for the inspiration! Gorgeous card and the colors are amazing! Very pretty! I love the new release! The flowers just POP from the page! GORGEOUS! So pretty! This looks like a wonderful release! I knew when I arrived here I would be wowed! Stunning! That's a whole bunch of beauties! Erum your card is awesome, love what you did with this gorgeous stamp set. Thank you so much for sharing this beautie and the great idea to use only the flowers behind the whole stamp. Beautiful card. Your use of colors is great. 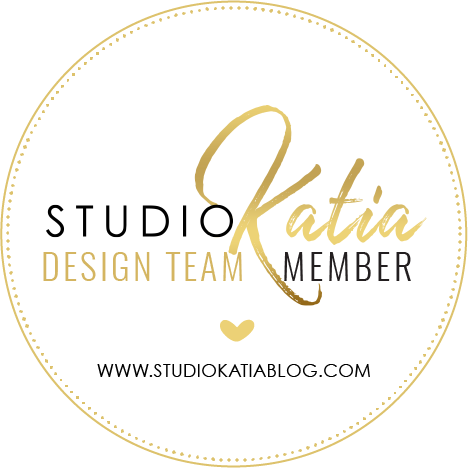 Really excited about this new Studio Katia release! Looking forward to these products arriving at my front door! Thanks for sharing this lovely card. I love how you used the image twice. Those little drops are the perfect accents. This is such a beautiful card! Your colors and your coloring are so amazing! I just love all of your color shading it's over the top amazing! Wow your colouring is just amazing. This tea cup image is my absolute favourite from the release! Such pretty coloring of this beautiful design! Lovely card! Stunning card! Gorgeous image and card design. Fantastic coloring as always. 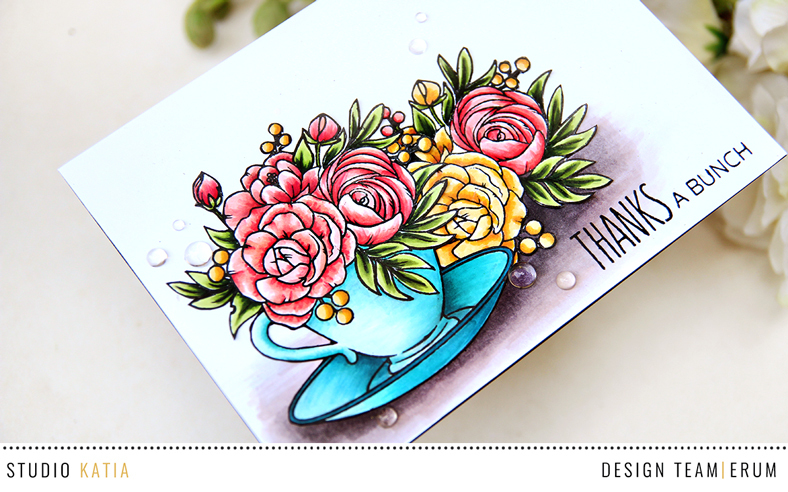 I love this stamp, a teacup with a floral arrangement has always been so very beautiful to me. 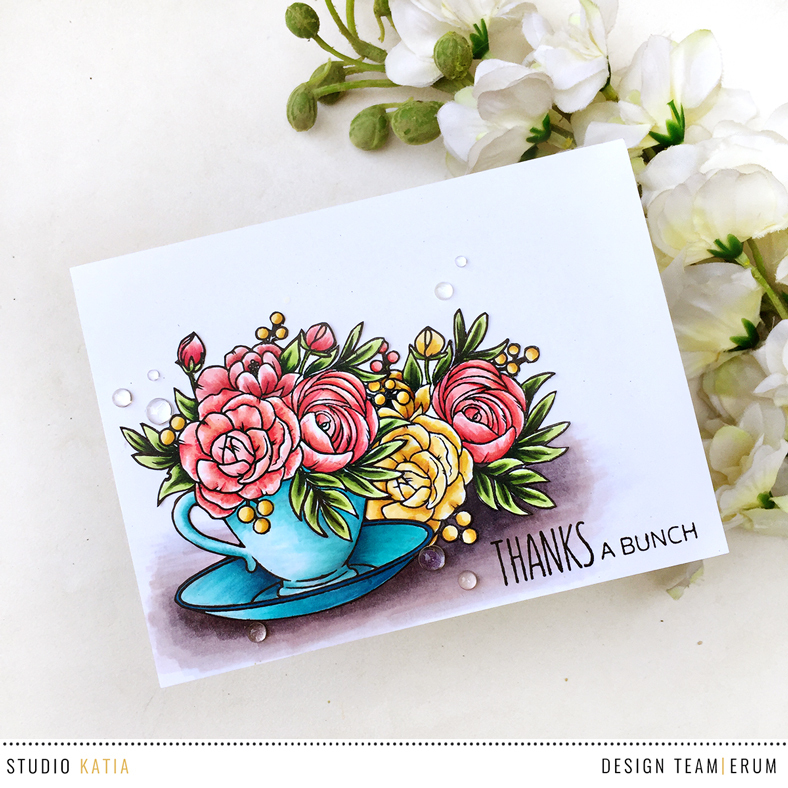 I love how you added the additional flowers behind the cup, stunning card. Thank you for sharing and for the inspiration. Totally agree that this release will fly off the shelves in an instant it's so gorgeous. Talking of gorgeous, wow your card is beautiful, so realistic. Do you use one brand of markets or do you mix between brands ? Great job, love this release and your take on it. Thanks for sharing. Beautiful card! I really love the colors you used- they are so cheerful! Thanks for sharing! A wonderful coloring job ET! As always, you have shown your incredible talent and we so appreciate it! Love the teacups and I do think it will be gone quickly! Cheers to a cuppa! Oh my! Awesome card!!! Love so much your amazing colouring!!! Very pretty! Your coloring is lovely and I really like the shadowing that you did. Oh, I love how you masked off the cup to get another spray of flowers behind the teacup. That adds so much depth to this scene! And your coloring is delightful, as always. You do shadows so nicely; it makes everything in your cards feel alive. Thank you for sharing with us! Just so pretty! I love the extra flowers you added behind the teacup! I love the bright colors you used on this card. Beautiful. Wow! Beautiful colouring! Love how you've layered the florals and I can totally see how this stamp set will sell out in no time. Your coloring is SOOOO VIVID and amazing!